As usual, I think I waited too long. The estimated lead time on receiving a finishing kit is eight weeks. Doing the complex mathematical conversion, that works out to roughly two months. At this point, I would be surprised if I was still working on the wings two months from now. That said, it won't take too many days with temperatures in the teens (or less!) to burn through those days, so it may turn out that I timed it just right. The 'Finishing Kit' is comprised of almost all of the little bits and pieces that converts a piece of aviation-themed sculpture into an actual airplane. Amongst the major components are things like the seat cushions, seat belts, engine cowling, wiring harness, landing gear components (including wheels, inner tubes, tires, and brakes), and fuel tank components. I have a few comments on a couple of those items. First, the wiring harness. This is a wonderful thing! While there will be wiring tasks such as pushing pins into connectors, stripping wires and splicing them to other wires, and crimping on terminals, there will be none of the truly difficult work like planning and laying out the entire electrical system on a blank page of paper. That said, there is a potential cost to ordering the finishing kit right now. 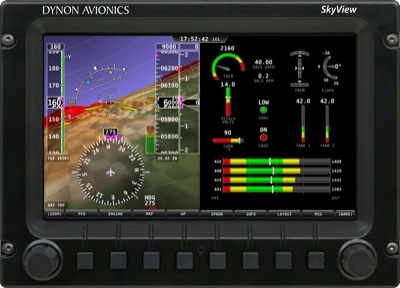 It comes down to the avionics; by ordering a wiring harness today, I have virtually committed to the Dynon D-180 as my major avionics component. There's nothing inherently wrong with that; the D-180 is a wonderful piece of equipment. 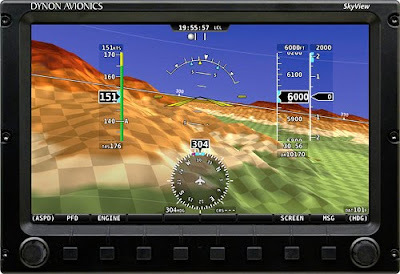 The problem (such as it is) is that there are strong rumors floating around that Van's will soon offer the newer Dynon SkyView as either a replacement for, or an alternative to, the D-180. The SkyView has a number of advantages and it is arguably a better piece of equipment, but I remain unconvinced on the merits that the additional capabilities are really necessary in a plane as simple as the RV-12. 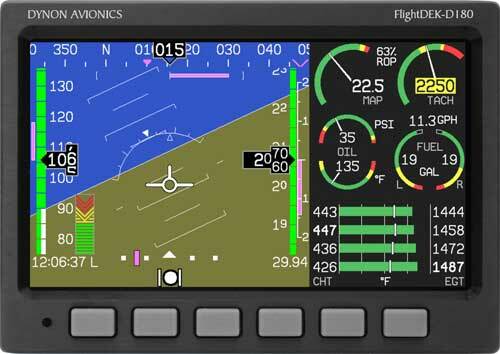 What is inescapable, though, is that it will be well supported by Dynon for a much longer time horizon than the soon-to-be considered obsolete D-180. For that reason alone I would consider it as an upgrade, although it would have to be very competitively priced in comparison to the D-180 for me to opt for it. Why do I have to decide now? Well, there will undoubtedly be changes to the wiring harness. After spending hours installing the current harness, I will not be likely to want to pull it back out again to install a new one, particularly as it will be much harder to do in a completed airplane. And, as you would expect, I would take a bath on the dollars already invested in the D-180. This uncertainty is one of my beefs with Van's. They keep things like this very close to the vest, making it impossible to make well-informed decisions. I'd say they could announce the availability of the SkyView option tomorrow, but they won't. I say "they won't" with such confidence because of an even more irritating thing, which is the cagey way that they announce new options. Which is to say, they don't. The first you'll know about it is when the option suddenly appears on the order form. This is exactly what happened with the optional prefabricated fuel tank. You have to understand that I have read a lot about other builder's difficulties with various parts of the construction process and from what I've read, there is no more painful process than building the fuel tank. More precisely, the difficulty seems to be more in the building of a non-leaking fuel tank. The tank is assembled from components in much the same way that the map box was. Because it is comprised of bent aluminum parts, there are large holes and gaps that need to be sealed to make it air/fuel tight. Having had the unhappy experience of using the tank sealant on other parts of the kit and reading about the numerous failed attempts on the part of others that have gone before me, and considering that the fuel tank in question is going to be sitting right there in the cockpit with me, I opted for the now-available prefabricated tank. It was exorbitantly expensive at $445, but I think it's worth it for the peace of mind that comes with it. My argument isn't with the price, though. What bugs me is that there was no announcement of a newly available product. Van's, oddly enough, is not run like a business. They don't seem to market to existing customers at all, relying instead on word-of-mouth. That works out okay for people that spend a lot of time online, but I wonder how less connected people ever find out about this stuff. Anyway, I opted for the prefab fuel tank, decided to bite the bullet on the D-180, and decided what color the seat cushions will be. I went with plain old tan cushions to match the interior paint and to guarantee that the colors won't clash with whatever exterior paint design I finally come up with. I haven't left the house for two days. The grey, dispiriting Columbus winter weather that has blanketed us for over a week now has shown only sporadic and short-lived efforts to move along. Yesterday was Christmas, and that meant spending the day at home enjoying the holiday. Today provided ample time to work on the airplane but it would been at the cost of going out to a very frigid hangar. The long and short of it is that I lacked the motivation to get decked out in my heavy winter duds. It seemed easier and far more comfortable to stay in and park myself on the couch with soon-to-be-dog (his 1st birthday is in two days) Cabot. He slept, I read a book on my new Kindle. Still, the nagging thought at the back of my brain was always present: "You really should do something productive today." The next time that I go to the hangar, it's highly likely that I'm going to go ahead and put the wing skins on the right wing. That wing is going to have to be moved out of the way so I can go back to working on the left wing and it will be better to do so only after accomplishing what would have been the next steps on that particular wing anyway, which is to skin it. As it stands right now that wing is especially vulnerable to damage. Once the skins are on, it will be much more rigid and the ribs will be protected. To put the skins on, the blue protective shipping plastic has to be removed first. That seemed to be a perfect indoor job. The removal of that plastic is by far the most onerous job of the entire build. It's normally hard to remove but I was told recently that it will come off much easier if heated with a blow dryer. I thought that might be worth a try. It turns out that the plastic does come off easier when heated, but the hand required to hold the blow dryer is also needed to hold down the aluminum while the other hand pulls on the plastic. Co-pilot Egg volunteered to operate the blow dryer while I pulled off the plastic, but she soon decided things would go quicker if the old man just moved out of the way. I did nothing to discourage her from going it alone. After all, I'm normally the first in line to let someone else do the dirty work - why should this be any different? Within half an hour she had followed my lead and enlisted her own helper. They enjoy comparing their boo-boos. You hear things you aren't used to hearing. In this case, "You smell nice. Is that your new perfume?" They're fine with using power tools, as long as you are willing to call a hair dryer a power tool. They can't work for more than two minutes without sending or receiving a text message. It took almost two hours, but all of the skins are now denuded of their blue cladding. I handed the helpers a $10 bill and sent them to the mall to hang around for the afternoon. I went back to the Kindle. Still lacking the missing rib, all I could do on the left wing was move it out of the way so I could start on the right wing. The wing is still very flimsy with the ribs being unsupported on one end and I was worried that they'd get bent while in storage, so I clecoed on the aft spar. The inboard end of the aft spar has four holes that will eventually be riveted to the matching rib, but the rib only has the same three holes as the rest of the ribs. Two of them align with the top and bottom holes in the hinge brace on the spar; the other two get match drilled. The wing is still light enough for me to move alone as long as I'm careful to pick it up at a balance point, but I'm still very paranoid about schlepping it around. There's 15' 3" of mayhem that can get caught up against something and cause an unfortunate accident. Things are really getting tight in the hangar. The wing is still narrow enough that I can fit it into the gap between the sailboat and the RV-6. That won't last forever, though. With the left wing parked off to the side, I was able to start on the right wing. The ribs get clecoed in in the same way as before. I'm still a little paranoid over the question as to which side of the spar flange the rib gets placed. You can see that the drawing requires a degree of interpretive effort. The tie-breaker for me was that the drawing shows the holes in the rib to be visible; if the rib was placed on the other side of the flange, the holes wouldn't be visible from the angle shown. In an odd and inexplicable case of asymmetry, the right wing is structured very differently from the left. On the right wing, seven of the ribs still have their front flange. That flange gets riveted to the spar. It's the same kind of tight fit that gave me so much grief when I was attaching rib flanges to the spar. This close-in riveting requires the use of the wedge thingy, and I was having a problem before with the mandrel of the rivet breaking off in the rivet puller. I went out and bought a new riveter in the hopes that the mandrel breaking problem was a symptom of a worn-out riveter and wouldn't reoccur with a new puller. The good news: the very first rivet broke off cleanly. The bad news: the very first rivet broke off cleanly and the mandrel got jammed in the new rivet puller. Uh-oh!! I had visions of every single rivet of the next twenty-eight behaving this way! The next twenty-seven rivets went fine, though. While I still don't like using the wedge thingy and it took a long time to get the rivets in, I figured it could have been worse. But it was done, and as I said, it could have been worse. I had used LP4-3 rivets. On all of them. They'd have to all be drilled out and replaced with LP4-4s. Now you're probably asking yourself, "How in the world could he have missed that?? Big, bold font and everything. What more could they do? How much more obvious could it be???" Well, here's how it is. I had Goetta for breakfast again today. It's a little known historical fact (by which I mean that I just made it up) that Hitler had Goetta for breakfast on the morning of the day that he opened an Eastern front by attacking Russia, and we all know how that worked out for him. Not buying that? Well, I don't blame you. What really happened is that I looked at the right wing as basically the same as the left wing and only glanced at the plans enough to figure out which style of rib went where. It was careless, and I paid for it by having to drill out all of those rivets and replace them with the correct size. The head of the rivet drills off easily, but because the rivet is too short for the hole, it's tough to get the rest of the rivet out of the hole. It's all swelled up in there, you see. It's like a monkey trap. monkey's hand to fit in, but not large enough for a monkey's fist (clutching a banana) to come out. Used to "catch" monkeys that lack the intellect to let go of the banana and run away. 2. (figuratively) A clever trap of any sort, that owes its success to the ineptitude or gullibility of the victim. Pay particular attention to definition #2. Anyway, This tool helps. What I did was take a $5 Harbor Freight center punch and grind down the pin. It works very well for pushing out the remainder of the rivet in cases like this. Unfortunately I ran out of time or I would have proceeded to rivet the aft spar into place. It looks like a wing, anyway. Well, standing ribs, anyway. No roast. As my annual Winter Sabbatical (also known as "practice retirement") proceeds apace, I'm falling into a nice day-to-day rhythm. No more am I getting up at 5:00 am; today I managed to sleep in until a positively scandalous 6:30 before getting up to start the day. Coffee, first, to savor while getting surfing the web and getting caught up on the news. A little later I make myself a breakfast, usually something just for me and my eclectic tastes. For the last two days it has been Cincinnati Goetta, a tasty German breakfast meat that is one of those things that are better served without looking too deeply into how they're made. The patties begin to sizzle. The pin oats swell and pop. The spices throughout the gloriously married pork and beef infuse the atmosphere. And the corners of your brain turn up to a grin. While the crumbles dance in the hot pan, the rounds color to a golden brown, and your tongue puddles with anticipation. The final patty is flipped unveiling a brilliant batch of toasted treasures. The belly roars. Your fork breaks the delicate crisp and moves carefully through the creamy middle of the morning circle. Every bite sends you deeper into total sensory engagement, and allows the mind to skip through the collection of stories that decorate your family’s history and your own. In a moment you are at your grandma’s counter enveloped in tales of her grandma’s kitchen. Your heart sings. The pure enjoyment you draw from each tender-crisp forkful testifies to the power of passion. Your delight drives that passion. And the contribution of your experience makes richer the fabric that forms the heritage and legend. This is the end of boring breakfast. This is the return to what matters. The return to what inspires. The return to what is right and good and real and delicious. Nearly poetic, but very telling in its lack of detail as to the precise ingredients. "What're the German words for lips and testicles?" he asks, apropos of nothing. With my luck? Probably "goet" and "ta." Once fed, I start to think about getting ready to go out to the hangar. By "starting to think," I really mean "starting to watch the thermometer." It's been pretty brisk in the early hours these week and I've found that if I can keep myself occupied with an old B&W movie on TCM for a few hours the temps will catch up with my internal thermostat. Today it was The Devil and Daniel Webster that carried me through the unappealing morning weather. Once it gets up to about 25F I'm ready to go. I'm still working my way through preparing the wing ribs. As we've seen before with the parts of this airplane, Van's prefers to make a single part and have us modify ("whittle down" would also be an apt description) sets of parts as necessary. For example, there is only one (well, two if you could "left" and "right" as different parts) type of forward rib, and one type (also with a "left" and a "right" variant) of main rib. Various numbers of each are customized to the demands of their relative location on the wing by means of amputation of various appendages. I started with the left nose ribs. Some number of them have no need for the back flange, so it is cut off. This is easily accomplished with the band saw, and is yet another argument in favor of not attempting to build an RV-12 without one. I started by placing a straight edge against the top and bottom flanges and using a Sharpie marker to draw a line for me to follow with the saw blade. The blade cuts straight and true through the thin aluminum quite easily. A smaller number of the ribs also required the excision of two of the little flanges in the nose area. After customizing a few dozen ribs, I had a flashback to the fuselage kit: install nutplates! These were a little odd in that they go on the outside of the rib; I had to be careful not to put them on the inside where they would appear to be more normally placed. The majority of the main ribs also lose their large flange. I think out of twenty-six ribs, something like seven actually got to keep that flange. A couple of the main ribs, one a lefty and one a righty, get a doubler added to them. Doing so requires a temporary clecoing to the rib and the match drilling of ten holes on each rib. Four ribs get the longeron hinge brackets installed. The plans only have a drawing to show the orientation of the parts for the "right" ribs. It took me awhile to mentally transpose the drawing to find the correct placement on the "left" ribs. In one of those weird non-linear progression moments so prevalent in the order of operations, we then returned to the braces that had been match drilled a few steps prior to finish the job with LP4-3 rivets. Finally, after hours of preparation it was time to start standing the ribs on the spine spar. In another of those odd dichotomies we're getting used to, the preponderance of main ribs used to attach to the left spar are "right" ribs. Only one "left" rib us used. The first "right" rib goes way out on the very outside end of the spar. I spent a lot of time making sure that I was putting the rib on the correct side of the flange mounted to the spar. It would be a royal pain to fix if I got this wrong! The next rib is one of those that hosts a flaperon hinge brace. Being all top heavy like that, it wasn't keen on standing up straight with just a few clecos holding it in place. There's plenty of room between ribs to fit the riveter in there. The rivet holes are far enough away from the spar that the little cheater wedge isn't required. The new riveter worked great! I had to leave a gap because I'm still missing the loaned out rib. Figures it would be one that I need early in what is sure to be a lengthy process. I hope to retrieve it tomorrow. The most inboard rib is the one that had a doubler riveted to it. It mounts on the opposite side of its respective spar flange than the rest of the ribs. I won't be able to rivet it in until the missing spar is in place because the gap between these ribs is much tighter than it is on the outboard ribs. seem to me the ribs could travel home where it is warm but maybe it doesn't take that long to justify the possible damage caused by transporting them. Well, no, it wasn't really a question of difficulty or risk. It was more that I have become so obsessed with finding ways to deal with the cold weather that I never considered the most obvious way: don't go out in it if you don't have to. It was a form of target fixation, I suppose; I was so keen to defeat Winter at its own game that I lost track of the bigger picture. I mean, how hard could it be to gather up a couple of pounds worth of ribs and carry them back to the house? Not very, as it turns out. although I did have another incident with the car key to the Forester. The last time I had an inconvenient bout of clumsiness with this particular key was on the day of my ignominious defeat at the hands of the sailing gods. I ended up pulling the boat around to the other side of the pier and yanking it up onto the bank. I didn't want to have to do that - that side of the pier was filthy with yucky green algae and floating trash, and it smelled horrible. There was no choice, though. I went and parked the car ("How long was you in fer this time," I heard as I walked by the happily disinterested witnesses) and went back to retrieve the boat. I thought I'd go ahead and get my life jacket on and put my car key in the water proof box before putting the boat in the water. As I was trying to snap the buckle on the life jacket, I heard "PLOP," and looked down just in time to see my car key sinking below the algae. If you think I was reluctant to pull the boat through that crud, how do you think I felt about reaching down into it to fish around looking for my car key? Today I dropped the key into a pile of snow. You may remember how flush I was with the success of modifying my new gloves to make them more suitable for working with small pieces-parts. Well, as fate would have it that modification also made them completely unsuitable for fishing around in a pile of snow looking for a car key. Still, it was worth it. Spending a couple of hours slogging through a pile of wing ribs in the relative comfort of the basement instead of shivering in the hangar made it all worthwhile. I may be wrong about this (so don't quote me in polite company), but I think it is good enough to get the ribs fluted such that they will sit flat with only light finger pressure holding them in place. I think the clecos and rivets will pull the ribs into alignment with the outer skins quite easily and without adding undue stress as long as the ribs are willing to comply without resistance. With that in mind, I soon developed a method that would allow me to routinely get the ribs to sit flat on the first try. Every now and then one of the ribs would need a small correction, but nearly all of them were good on the first try. My method was to first put light flutes along the bottom of the rib. Then I'd flip the rib over and start at the notch in the center, moving towards its front leaving ever-deeper flutes as I went. The first few were as shallow as those on the bottom flange, but by the time I got to the very front I was fluting as deeply as the pliers would allow. I knew when to start making the deeper flutes because there are "inverse flutes" in the flanges as the curvature of the rib increases. It makes sense to need deeper flutes here when you consider that the idea of fluting in the first place is to relieve the pressures brought about by bending the flange in a curved surface. I'd finish the rib by going back to the center notch and running shallow flutes to the back of the rib. I'd check the rib by lying it on the workbench and seeing if I could get it to sit flat with light finger pressure. Caveat: I have not yet fitted any of these ribs to the wing. I do not know if they will require further fluting (or, heaven forbid, unfluting) or adjusting.